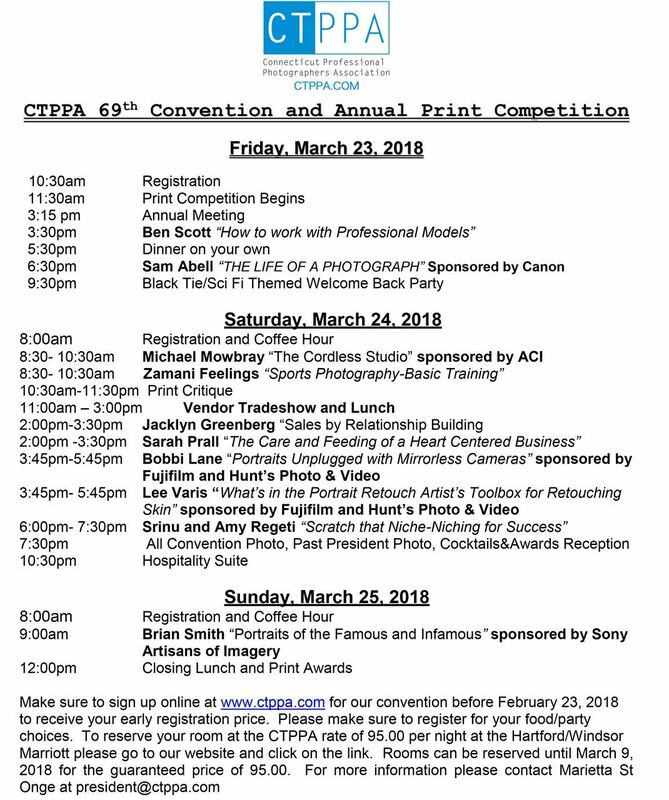 Join us for some food and to help us recognize those who give back to photography and the CTPPA. Business Casual. Registration by March 19, 2018 is a must. Join us for a late night welcome back party complete with DJ, photo booth, cash bar and food. Come dressed in your best black tie or Sci fi costume for a prize! Join us after Brian Smith's program for lunch and a look back at the "Converge 2018" as well as a look to the future for CTPPA. Print Awards will be given out as well. Registration by March 19 is a must. Member in good standing with dues paid. Requires a late fee payment. Includes all convention speakers. Meals require an additional payment. Member in good standing with dues paid. Also includes a buddy pass at no cost. Only one buddy per affiliate registration. No affiliation to another PPA group or CTPPA. This includes all convention speakers. Meals are an additional cost. All Non-members are allowed to bring one guest on a "buddy pass" at no additional charge. It's a great way to save on the cost of registration. This price is for print competition entries that are received by March 19, 2018. To reserve your hotel room at the Hartford/Windsor Marriott click this link please reserve your room by March 3, 2018 to get the special CTPPA rate of 95.00 plus tax per night.